So many ways to inspire your crafting, I find that Fashion and Crafting go hand-in-hand. The card stock is much like a fine material, with long fibers, with metallic and pearl accents, buttons, ribbons, colors, and more. 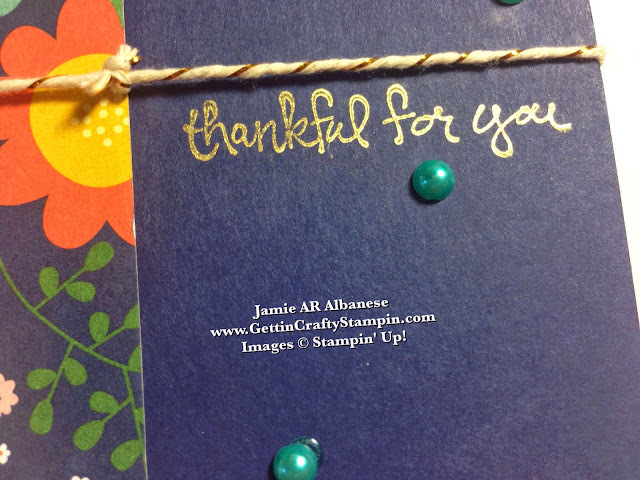 So join me this Fashion Friday post in creating a fashion inspired card to show how thankful you are! Fall brings a fun selection or rich colors and patterns. Here this fun outfit makes for a stylish hand-made card. Happy Fashion Friday! Now, I need to locate a dress like this for my collection! 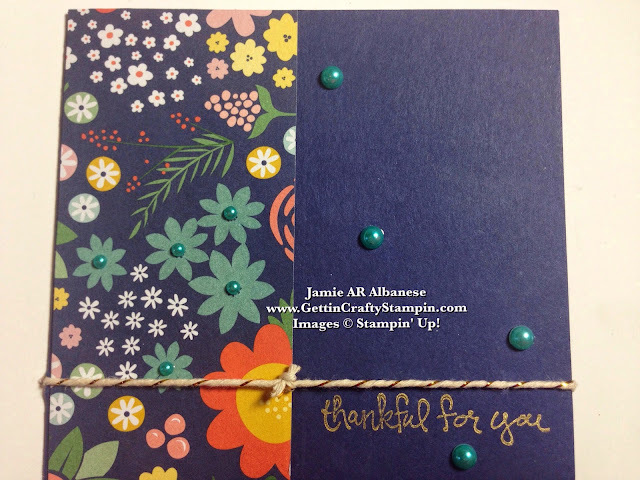 This is a wonderfully easy hand-crafted card to create. Using the Night of Navy card stock base, add a strip (2"x 5-1/2") of the Flowerpot Designer Series Paper using the SNAIL adhesive. This mimics the pattern and colors in the dress. Color the Pearls for an additional pop of luminous color. Using the Coastal Cabana Blendabilites Markers on the adhesive backed Pearl Jewels. I color it in before I adhere it to the card. I love the results. This new FREE Stamp Set, Good Greetings is adorable!! See HOW to bring it home when you Click Here. Stamping it in the Gold Encore Metallic ink pad for a dash of gold to this card. It stands up to the base of the Night of Navy card stock. Tie on the Gold Baker's Twine for a belt like feel. I love this subtle gold accent on this card. Create a clean, elegant and pretty hand-stamped card that takes mere moments to create. 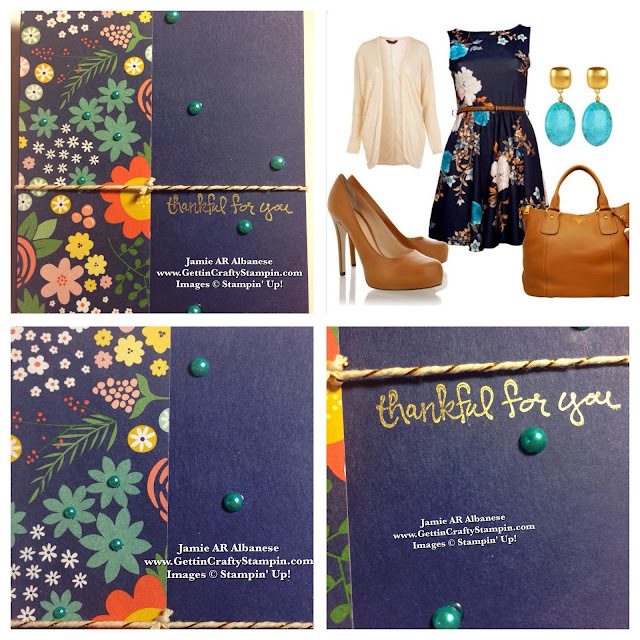 I love how this outfit inspired this hand-crafted card on our Fashion Friday. Creating a hand-crafted card that is inspired by Fashion is a fun way to combine two things I love! When you have rich colors, patterns, pearls, gold accents and you combine them you can see how they are associated. So find your inspiration and Create! 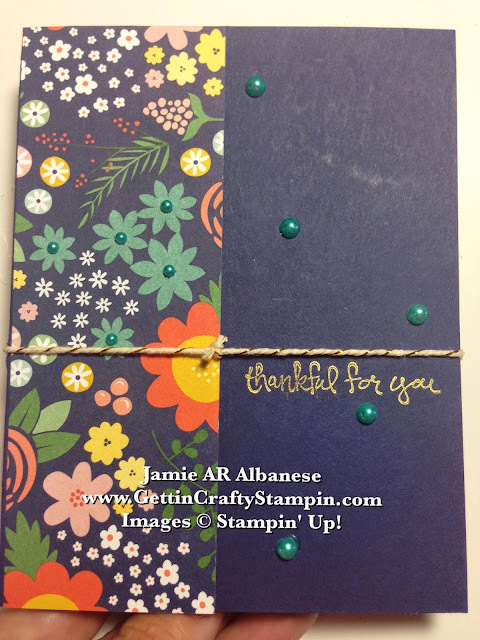 Have fun with your crafting, rubber stamping, card making, etc. 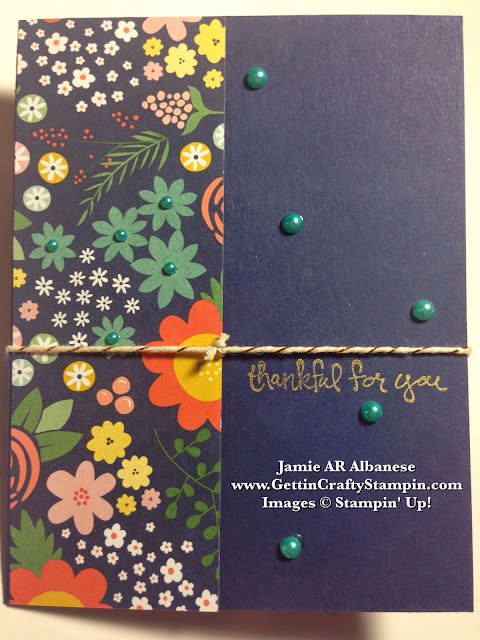 I hope that this inspires you to have fun and find cool inspiration in your hand-stamped card making.